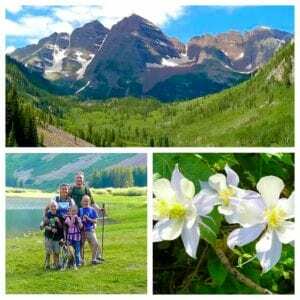 As our agency starts our 52 Week Series: “52 Things We Love About Colorado,” we knew our number one choice would have to be the Maroon Bells outside of Aspen, Colorado. The Maroon Bells are two peaks in the Elk Mountains, Maroon Peak and North Maroon Peak, separated by about a third of a mile. They are located about 12 miles southwest of Aspen and the peaks stand at 14,163 and 14,019 respectively. With Maroon Lake nestled beneath the majestic peaks it is no wonder that this location is reputed to be the “most-photographed” spot in Colorado and is said to be one of Colorado’s premier scenic overlooks. Go to www.recreation.gov to reserve your campsite! The campgrounds up by Maroon Bells are Silver Bar, Silver Bell and Silver Queen. You’re sure to be blown away by the scenery and will create great memories in the process!